Horace R. Wait, Merchant and Real Estate Dealer, was born near Amsterdam, NY, being a son of William Wait, under whose guidance he received his early business training, at Whitehall, NY, and at the death of his father, he and his brother succeeded to the business, under the firm name of H. R. & W. F. Wait, conducting the business for three years, when the subject of this sketch became the sole proprietor and continued the same until 1886. 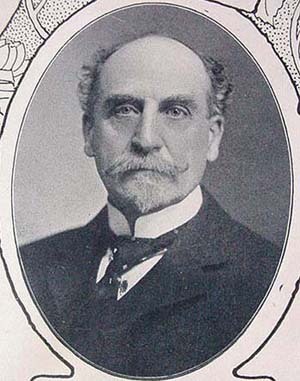 He then came to Auburn and established his present business, Carpets, Upholstery, and Furniture, and his son, J. Reynolds Wait, a graduate of Yale University (Class 1903), is associated with him. Mr. Wait is also in the real estate business, a director in the Cayuga County National Bank, and interested in other business enterprises. He is a trustee of Central Presbyterian Church, and connected with social and business organizations. the site now occupied by Genesee West Apartments. 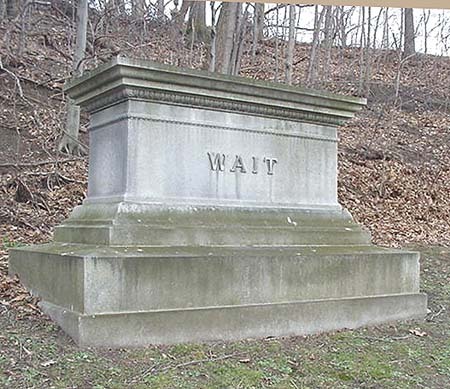 The Wait monument is located in the Cemetery's Consecreation Dell section.